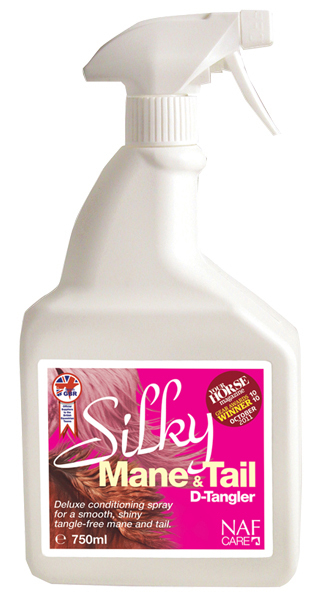 NAF Silky Mane & Tail D-Tangler is a high quality conditioning and nourishing spray which quickly makes troublesome tails and manes smooth, glossy, elegant and tangle-free. Contains Lavender & Rosemary essential oils, geramiol, limonene and lonalool. Spray directly onto mane and tail, allow to dry and comb through. Leaves a non greasy, non sticky natural shine that will not attract dust and allows mud to be easily brushed from hair. NAF recommend a small patch test is carried out before initial use. There are currently no questions for NAF Silky Mane & Tail D-Tangler - be the first to ask one!